Fairness is always difficult. It is often impossible to achieve in systems where many people make multiple choices. Kenneth Arrow won a Noble Prize in economics, and has an Impossibility Theorem named after him for his work showing how ranked voting systems are impossible to make inherently fair. More precisely his theorem says that when a voting system is trying to rank 3 or more candidates that it cannot optimize different aspects of voting fairness at once. 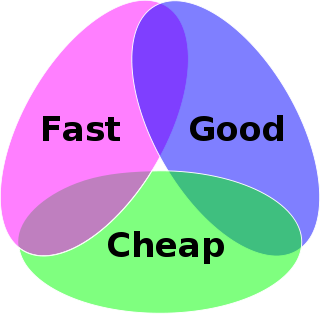 It’s sort of like the old proverb “fast, cheap, good — pick any two” because you can’t optimize all three. Mathematically when more than 3 candidates are being ranked in a vote some aspect of fairness — either ensuring that each vote has similar weight, or that each outcome has a similar chance of happening or some other criteria of ranking fairness — must be infringed. Every search algorithm, which is another way of ranking choices, is likewise inherently unfair to some of the sources it is ranking. It does not matter whether the search engine is Bing, Ask, Google, or one not yet invented, a ranking of page results cannot be fair in every dimension of fairness. It will be biased in some way, just as every voting system is biased in certain directions. Nonetheless, we want fairness. Neutrality. Search is both an essential service in our lives today, and also a very big business. News, commerce, identity, and indirectly the principles of freedom flow through the tools of search engines. Their power can be misused. We’ve seen that in China, and we can imagine it in theory. If a search algorithm is inherently biased, is there a way to establish or mold it to be more neutral? 1. Equality: Search engines shouldn’t differentiate at all among websites. 2. Objectivity: There are correct search results and incorrect ones, so search engines should return only the correct ones. 3. Bias: Search engines should not distort the information landscape. 4. Traffic: Websites that depend on a flow of visitors shouldn’t be cut off by search engines. 5. Relevance: Search engines should maximize users’ satisfaction with search results. 6. Self-interest: Search engines shouldn’t trade on their own account. 7. Transparency: Search engines should disclose the algorithms they use to rank web pages. 8. Manipulation: Search engines should rank sites only according to general rules, rather than promoting and demoting sites on an individual basis. As we shall see, all eight of these principles are unusable as bases for sound search regulation. Just because search neutrality is incoherent, it doesn’t follow that search engines deserve a free pass under antitrust, intellectual property, privacy, or other well-established bodies of law. Search engines are capable of doing dastardly things: According to BusinessWeek, the Chinese search engine Baidu explicitly shakes down websites, demoting them in its rankings unless they buy ads. It’s easy to tell horror stories about what search engines might do that are just plausible enough to be genuinely scary. My argument is just that search neutrality, as currently proposed, is unlikely to be workable and quite likely to make things worse. It fails at its own goals, on its own definition of the problem. 5. Relevance — Search engines increase relevance to users by making subjective choices, downgrading or upgrading sites based on what they think their users want, not what the sites want. “Search engines compete to give users relevant results; they exist at all only because they do.” Outside of users, relevance is hard to define and harder to prove, and not useful. In conclusion, Grimmelmann declares the impossibility theorem. Search engines favor users over websites, and to some (websites) that may seem unfair. Search neutrality gets one thing very right: Search is about user autonomy. A good search engine is more exquisitely sensitive to a user’s interests than any other communications technology…..Having asked the right question–are structural forces thwarting search’s ability to promote user autonomy?–search neutrality advocates give answers concerned with protecting websites rather than users. With disturbing frequency, though, websites are not users’ friends. Sometimes they are, but often, the websites want visitors, and will be willing to do what it takes to grab them. Google is not neutral. And it can never be, nor Bing or any search engine. As long as Google favors the user over the commercial interests of websites, and as long as they are reasonable in bridling their own commercial self-interests in favor of the user, then their non-neutrality will keep them going, and keep us happy.